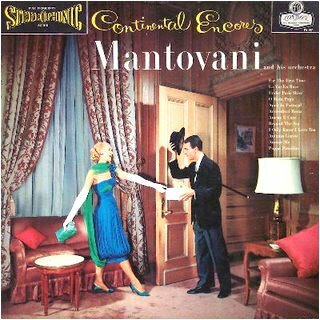 LISTENING NOTES: Mantovani's magnificent "Continental Encores"
You need only one magic word: Mantovani. That's right, Mantovani! I know some of you may be rolling your eyes. Who the hell listens to Mantovani these days, I mean my parents listened to that! If you are around my age, your parents had a Mantovani LP or two. (It's funny, but as an audiophile now in my 40's, I am listening to and own many of the very same records they did, things like Dave Brubeck's "Take Five", Morton Gould's "1812 Overture" Stereo Spectacular, Fiedler's "Music from Million Dollar Movies", Johnny Mathis' "Heavenly", even Rusty Warren's "Knockers Up!" The Mantovani LP they had was "Exodus and Other Great Themes" (a blueback! ), but the title we are concerned with here is "Continental Encores" on London PS 147. This was pressed in England by Decca, bears a blue and silver wideband FFSS label, and is housed in a blueback jacket with the Full Frequency Stereophonic Sound logo in the upper left front. It is a very common record, found in almost any thrift store for a dollar or less. It lists for $20.00 in near-mint condition in Goldmine. However, finding it in near-mint condition is the exception rather than the rule. People tend to have played these records often, so inspect the grooves carefully for wear, and check labels for spindle trails. Be sure that the record label states "Made in England" - if it doesn't, you have an American pressing, which is to be avoided. By the way, to clear up an old audiophile myth, Decca pressed records for both Great Britain and America at their facility in England. Due to the fact that the rights to the Decca name in the United States were unavailable, Decca released their products under the London name. The records for export were given the London label, which was identical to the Decca design, but of deep red color (for Classical or blue for the Popular series) rather than black. London took over from there, and handled the jacket design for the USA. This accounts for the many titles with artwork that differs from the Decca jacket. The controversy was started sometime in the late 70's, when the audiophile press (and many dealers and collectors) claimed that the imported London issues were sonically inferior to their Decca counterparts, and that Decca deliberately produced records to a lower standard for the American market. The effect of this myth still lingers in the used record market with the higher pricing of a Decca version over the London, even though the record is identical, pressed at the same time, with the same stampers. As I prepared the record for evaluation, I started to wonder how an artist who was enormously popular for over two decades, and who developed a fanatical following through dozens of recordings and concert appearances, is held with such indifference today. The answer is simply ignorance. The magic of Mantovani is in the very special sound he gets from his orchestra, particularly the violins, which are arranged in an unconventional manner. Normally, Mantovani uses twenty-eight strings (six first violins, six second violins, six third violins, four violas, four cellos and two double basses) balanced against thirteen brass, woodwind and percussion. The result is a thrilling sound, with soaring and cascading violins, sensuous and colorful melodies played with warmth and emotion. This is an extremely well done recording, taking full advantage of Decca's FFSS technique. In spite of the unusual arrangements, it does not come across as a gimmick, but as opulent and emotional. It's true that this approach would not work in the standard classical repertoire, but it seems perfectly suited to Light Classical and "Pops" material, which Mantovani specializes in. 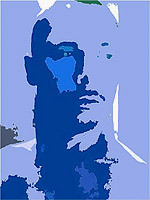 "Continental Encores" is like having a box of fine Belgian chocolates - each piece is a distinctive sensual pleasure. Some of the titles include "Under Paris Skies", "La Vie en Rose", "April in Portugal" and "Arrivederci Roma". I would never have believed it, but I have to admit it: I now LOVE Mantovani. Highly recommended!